When you're looking for a sporty new SUV that's as responsive as it is versatile, see the 2019 Toyota RAV4. The all-new 2019 RAV4 boasts fresh new style inside and out plus loads of new features that are sure to excite drivers and families! With an impressive list of standard cabin and safety technologies at a competitive starting price, the 2019 RAV4 shines with exceptional value and versatility. Toyota's next generation of infotainment and driver-assist systems come standard on the 2019 RAV4. The new Entune™ 3.0 Audio is more intuitive and offers smartphone app integration, while the Toyota Safety Sense™ 2.0 suite of driver-assist technologies now includes Road Sign Assist to help you keep informed of the speed limit and other important road information. Lou Fusz Toyota is eager to introduce St. Charles and St. Peters, Missouri area drivers to the all-new 2019 Toyota RAV4. Visit our dealership or shop our website now to discover an array of well-equipped new Toyota RAV4 SUVs for sale in St. Louis, MO. Your high-tech new SUV awaits you in the form of the next-generation RAV4, so don't hesitate to contact us or stop by for a tour and test drive! 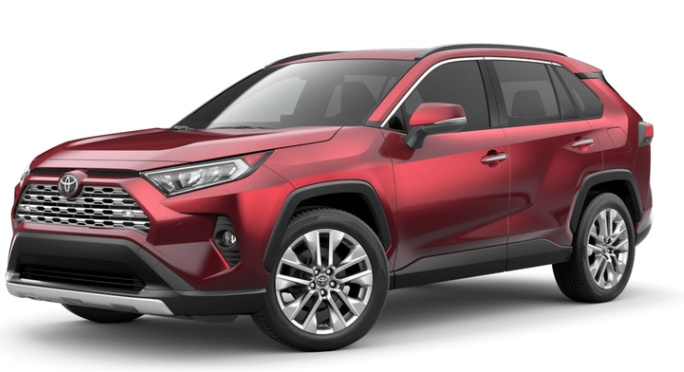 For the all-new 2019 model, the RAV4 is available in five distinct trim levels, with RAV4 Hybrid versions also available this year. From the RAV4 LE base trim and up, an available All-Wheel Drive (AWD) system is offered, along with Multi-Terrain Select for enhanced traction on all road surfaces. The XLE model adds creature comforts like a dual-zone automatic climate control system with rear-seat vents and a Smart Key System; added safety tech like a Blind Spot Monitor with Rear Cross-Traffic Alert is also included. Turn to the range-topping Limited trim to enjoy cabin technologies like an 8-inch touch-screen display with Dynamic Navigation and a digital rearview mirror. Heated and ventilated front seats, heated rear outboard seats and a panoramic glass roof are also offered on the Limited. With every new Toyota comes a complimentary ToyotaCare no-cost maintenance plan, which we invite you to take advantage of when you return to our dealership for routine maintenance at our Toyota service center. For your Toyota financing needs, remember to turn to Lou Fusz Toyota, serving St. Louis area drivers.